We install, repair, replace and service well pumps, well tanks, water treatment and conditioning systems, as well as any related components. And if you need help deciding which system or piece of equipment to choose, we can help you with advice and professional recommendations. We carry every type of residential jet and submersible well pumps. Are you drilling a new well, upgrading your old pump or replacing a failed pump? If so, you can depend on us for well pump selection and installation. If your get your water from a well, a water treatment system will improve its taste and feel. The professionals at R & G can install, maintain and repair water treatment systems. Is your well failing to meet the minimum yield requirement or running out of water? Or maybe your older well is running out of water? 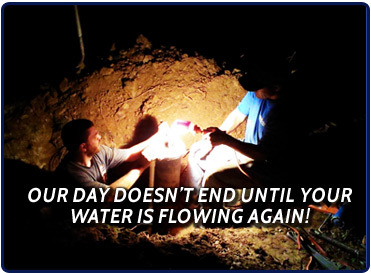 Know that re-digging is not your only option—let R & G Water Systems take a look and offer you a few ideas. A free consultation is how we like to start our relationships with customers. Feel free to tell us about your water issues and pick our brains as to what could be the cause. Consultations like this allow us to offer accurate estimates and solve problems faster—sometimes even right there, on the phone! Are you relying on bottled water for drinking and cooking? Do you have reasons to suspect your tap water isn’t safe to ingest? Let our professionals at R & G Water Systems help you improve your home’s water quality by installing an appropriate system that will remove unwanted water contaminants. Has your water completely shut off or are puddles forming in your yard? This could be an issue with your well line. The experts at R & G can deal with any pump or well line issue that you may encounter. Have any questions? Call us or fill out the form below for a free consultation.